there is a conscious need for a commuting bicycle in portland, oregon and doubtless the same could be said for towns and cities all across the world. that bicycle, however, need not conform to the archetype of sluggish and ponderous, for even the pelotonese have need of a utlility machine from time to time and desire something a tad more sprightly than a butcher's delivery bicycle. the beloved every day fits the bill very nicely thank you very much, presenting a slim, purposeful profile that encapsulates pretty much everything it promises. 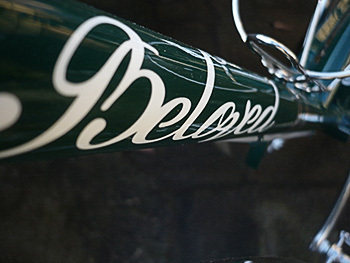 built by the cielo department of chris king's in portland, it eschews the tig welding associated with the latter, in favour of columbus tubes and lugs presenting an understated, yet traditional appearance. perhaps the only frame feature that may seem a touch out of the ordinary is the short curved tube between the lower portions of both seat tube and down tube. though this has experienced subtle variations in shape since birth, its purpose in life is to aid carrying over kerbs, stairs and the like. 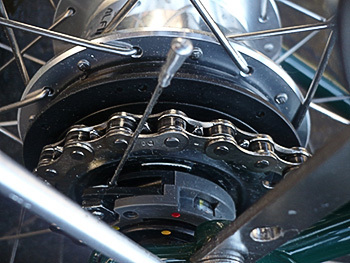 gearing on the review model was by means of shimano's alfine eight speed hub model operated by a bar-mounted double lever reminiscent of the rapid fire found on many mountain bikes (the every day can be had with a chris king single speed as an alternative). confusingly (at first), the thumb lever in fact provides a bigger gear, while that operated by the forefinger provides easier pedalling. for one incessantly used to riding derailleurs, it took longer than absolutely necessary to remember that the gears could be changed while the bike was stationary, resulting in one or two close stalls. naturally enough, no derailleur means no chainline problems leading from the sugino crank to the rear sprocket. it should perhaps be noted that the crank on current models is supplied by paul components as are the brake levers, and not as shown in the photos. this direct chainline allows for a suitable chainguard to keep those chinos looking clean while front and rear fenders/mudguards carry out additional duties in this respect. also from paul components are the strudy looking cantilever brakes. as i mentioned in my opening gambit, this is regarded as a commuting cycle and as such features a minimal rear rack to which a variety of items could be fastened. 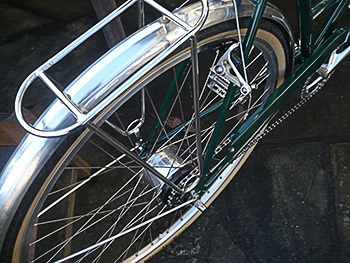 the bars of the lagavulin green example on which i got lost several times, swept midway between straight and those more regularly seen on a sit up and beg type velocipede, with brooks leather grips providing a quality touch to the steering. 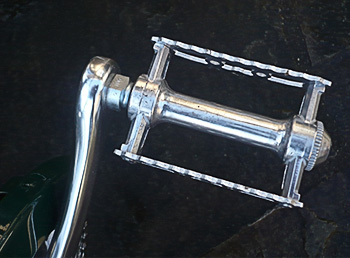 though affixed to an ahead stem, it warmed the cockles of one's heart to notice that the fork steerer rotated within a 1" chris king headset. why did we ever change? in contrast to the italian tubing, the fork blades were courtesy of america's true temper displaying a comfortable curve on their way to the front dropouts. 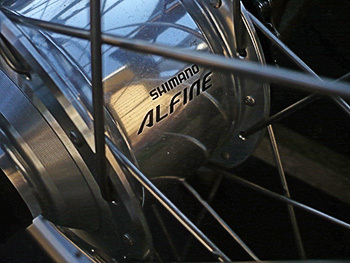 the wheels are handbuilt by jude kirstein at sugar wheel works in portland, the rear most obviously being constructed around the shimano alfine, while the front toed the corporate line and came from chris king. tyres were the remarkably tough, yet comfortable panaracer tourguard 700x35c. though i had brought along a pair of crank brothers eggbeaters, these were surplus to requirements, a pair of mks quill pedals being part of the package, as was a bottle cage. 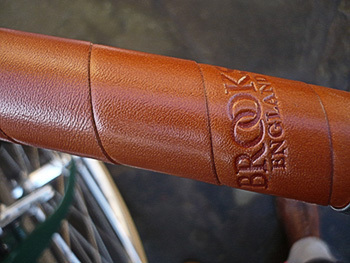 the brooks leather grips were colour matched to a brooks b17 leather saddle, entirely in keeping with the every day's character. 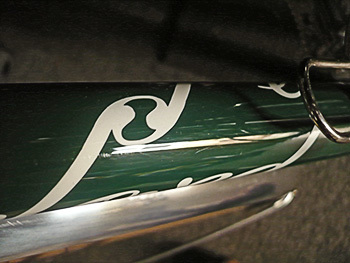 particular attention has been lovingly paid to the beloved logo on the downtube, for not only is it delineated in a delightful script, but the letter 'l' has joined hands across the top of the tube in a most attractive fashion. art does indeed lie in the details. 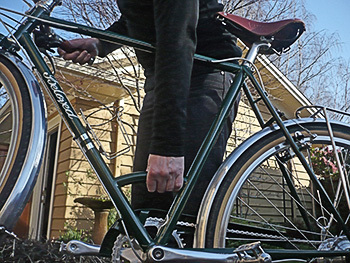 this particular bicycle was kindly lent by beloved owner and designer, james selman and was in the possession of mark ontiveros' bicycle store, westend bikes in downtown portland. as i mentioned earlier, i had expected a review cycle to be presented minus an appropriate pair of pedals, so it was a cheery surprise to have the every day handed over by westend's mechanic replete with a regular pair of quill pedals, affectations which admirably suited my dromarti storica shoes. having reviewed many bicycles over the years, it was something of a trial to learn to ride on the right side of the road which by definition is the wrong side of the road. add to that, this was my first outing alone on a bicycle in portland with no-one riding in front to ensure i adhered to this errant mode of riding. thankfully, i had been driven to westend bikes along the route on which i was required to return, and it was therefore a simple case of following instructions. as a stranger in a strange land, this was not the ideal way to begin a bicycle review. i did, however, forgotten gear changes aside, manage to remain on the correct side of the road all the way home until i turned into 28th avenue, at which point i found myself riding along the left side of the road. the shimano alfine's eight gears are nigh on perfect, both in operation and in terms of ratios on offer. i know this because i was so intent on either making sure of where i was or, more often, getting utterly lost in places where it should be impossible to do so, that i was relying entirely on feel for starting off from junctions and sprinting eagerly to avoid being caught at red lights. the latter i never quite got used to; aside from the fact that american traffic lights switch directly from red to green without proceeding via amber, they are usually suspended above the middle of the road. the exciting factor that was dramatically delivered without any prior indication was the almost effortless acceleration. i'd gone riding on sunday aboard a tony pereira rapha continental bike, one that acquitted itself well, even if its rider didn't. somehow a cycle with 35mm tyres and devoid of drop bars ought to have little in the way of comparable agility, relying more on a ponderous trammel to reach its destination. however, if we bear in mind that the two main triangles are of columbus tubing, a material that has garnered more than its fair share of race victories, this should likely have been less of a surprise. on the tuesday morn of my visit, slate olson and i formed a convoy of every days (he aboard the rapha single speed version) on the way to headquarters in mississippi. since mr olson knew precisely where he was headed, and was inclined to enjoy a sprint or two before a day at the office, there were more than a few occasions when the elastic stretched further than i'd have liked, leading to brief out of the saddle bursts in order to keep up. those were the fabulous bits. if i wasn't such a dyed-in-the-wool roadie, the alfine gearing would have little problem in persuading me to dispense with derailleurs. switching gears to keep pace with the frame was far more effortless than my puffing and panting just off mr olson's grey and pink rear fender. such abilitiy to accelerate and cruise when desired owed probably just as much to the build of the wheels. despite visually clodhopping tyres, accentuated by larger than life sidewalls; it took less than massive power (just as well under the circumstances) to rotate the sugar hoops that wee bit faster. conversely, when it came time to slow or scrub off some of that less than hard-won speed, the cantilevers expressed superb efficiency, and i heartily commend the mechanic at westend bikes for setting them up without the merest hint of a screech. the strong and silent type (brakes, not the mechanic). i adore brooks saddles, from aesthetic, historical and comfort points of view; aboard the beloved, it was a match made in heaven. though the every day treads a fine line between sitting sleekly forward and a more commuter oriented upright position, the b17 adapted to either extreme, and the amount of cockpit room on the 54cm ridden allowed for an easy and sometimes constant shifting about in reaction to road conditions and the amount of personally induced terror experienced. the present rapha headquarters in mississippi are situated up a flight of stairs above a small garden centre. it behoves even itinerant visitors such as myself to take their velocipedinal transport indoors to hang on the bike rack, a task eased greatly by that small curved tube between seat and down tube. its positioning is presactly on the balance point, leaving any huffing and puffing behind on the road. having worn a single malt tweed musette in order to take care of any minimal cargo requirements, i had no need of employing that rear rack; a pity, for its size and positioning seemed ideally suited to the modern day commuter. portland was, without doubt, the ideal location to review this bicycle; though i have little fear for its safety when moving between islay's villages, the lack of a drop bar position would surely have made headwinds a greater task than they already are. it would, of course, be perfectly possible to fit drop bars of choice, but at the very real risk of upsetting the feng shui engendered by this finely judged bicycle. it is also very aptly named, for were i to be ensconced in any city location for a period of time, this would indeed be the cycle of every day choice. it possesses a sense of style that few of its genre can approach, harbours a secret desire to be mark cavendish in sheep's clothing and embodies the very definition of pragmatism. a boring old fart such as myself would be less likely to opt for the single speed version (though the legendary chris king buzz was sorely tempting), but in the name of reduced complexity it is undoubtedly a choice worth considering. despite my final trip in portland being through freezing rain along the springwater corridor that borders the willamette river and across the morrison bridge, i can't say i was overjoyed to return to shanks's pony on the way home. a truly marvellous bicycle that held more pleasant surprises than i'd have thought possible. thank you to james selman of beloved bicycles and westend bikes in downtown portland for providing me with the opportunity to ride the every day. i can assure you, it was greatly appreciated and fondly remembered. posted friday 9 march 2012.